This screen will display all invoices, open sales order quotations/bids and return invoices. 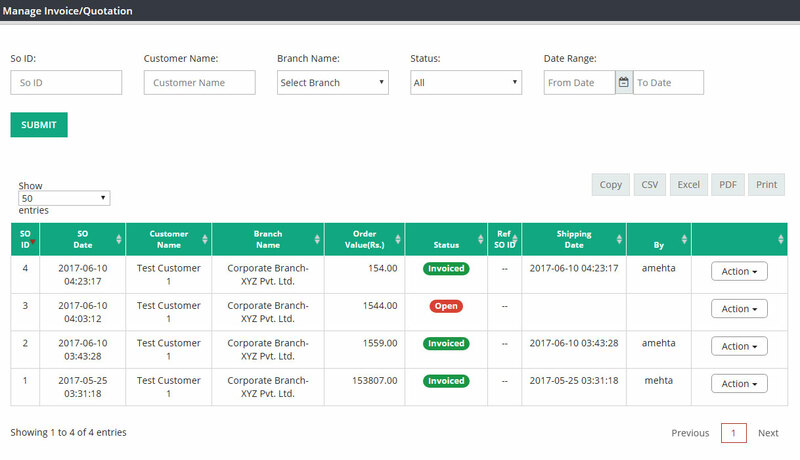 Through this screen you will be able to invoice and edit any open sales order quotation or bid which you have created in create invoice screen. You will able to generate return sales invoice using Return option from Action drop down box. Please use these options to search the invoice or open sales order or return which you are looking for. Data will display on this screen with above column details. You can copy and download and print the data from this screen by clicking on COPY/CSV/EXCEL/PDF/PRINT options. Please use this action button to view, download, Edit, Cancel, download packing list etc. Edit : You will be able to EDIT only open sales invoices/quotations. View : You will be able to view all open sales quotations, invoices and return invoices here. Cancel : You can only cancel open orders. Download : Download the invoice copy to email/Print. Return : Click on return to process return invoices. Download Packing List : You can download and view packing list to get product pick location details.